ZuneBoards' renowned PityOnU has just dropped his highly anticipated zAlternator software. 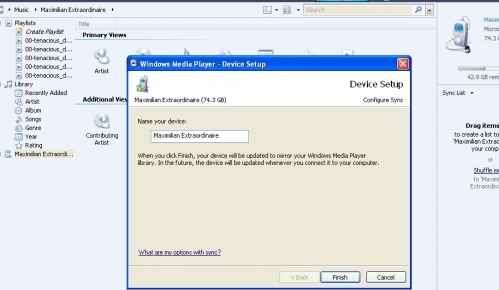 The hack, currently in RC, cloaks your Zune as a generic Windows Portable Device, allowing it to theoretically sync with WMP, WinAmp, iTunes, or your favorite media management library. The instructions are pretty basic too. Yes, that's my Zune in WMP... I can view files, sync, and reverse-sync with the device. It's pretty cool. Get your device into "sync" mode (have it show "syncing..." with the "starry night" Zune logo on the screen), and hit ctrl-alt-del, bring up Task Manager. Go to the Processes tab and end the process "Zune.exe". Now bring up zAlternator. Follow the instructions, setting the Desired Service Provider to "Generic" and then clicking "apply." Now open your program of choice and everything should be golden. Just keep in mind that for those wanting to use iTunes (blech), the service is still in beta. Use at your own risk.